Blasting has long been a basic tool in road and trail construction throughout the west. I recently spoke with Debra Davis, the lead blaster for the Okanagan/Wenatchee National Forest, and her counterpart in the Mount Baker/Snoqualmie National Forest, Bridget Wisniewski. Both told me that there is a lot more to this work than lighting a fuse or flipping a switch. I also learned that the number of certified blasters working for the U.S Forest Service is on the decline. They both agreed that there is a constant, if not growing need for blasting in Washington, but only five certified blasters working in the Northern Cascade Range where the PCT travels. Charges set and ready to blow at Red Pass. Traditionally, blasting was essential for building and maintaining roads so the timber industry could get logs to rail lines or ports. According to Davis, as the timber industry diminished during recent decades, the need for certified blasters in the Forest Service has declined. Many of the roads constructed for log trucks have been decommissioned or simply gone back to nature. But trail builders and maintainers still need this traditional tool. Blasting understandably has a dramatic effect on the environment. To carefully study the environmental and possible cultural impacts of blasting in designated wilderness, agencies must perform what’s called a “Minimum Required Analysis” or MRA. This is the project analysis required to support many activities in wilderness. Charges set to blast a large tree from the trail. Another reason there are so few blasters is the difficulty to obtain and maintain certification. The training required normally takes three years, under the close supervision of a senior blasting technician. Then there is a thorough FBI background check followed by authorization from Homeland Security. Add the annual review and training with the regional blasting supervisor for the U.S. Forest Service as well as the requirement to perform at least three blasting projects a year. For each project, there is a cascade of documentation—a trail of paperwork that details the purchase, transportation, storage and use of the explosive products. This is all in addition to a full-time position as wilderness or trails manager for a local ranger district. All the blasters made it clear that the explosive products they use are far safer than the homemade powder products of the 19th and 20th centuries. These products are far less volatile than the nitroglycerine (dynamite) of that era. She also made it clear that the military-type products seen in movies are far too expensive and not legally obtainable for non-military use. Trail construction in the West has always employed blasting to remove a rock face or form a ledge wide enough to safely travel with pack stock. This was the case for two projects in 2016: Red Pass in Glacier Peak Wilderness at mile 2,502 and Granite Pass at mile 2,598, just north of the North Cascade Highway. Forest Service certified blasters dug and drilled into the rock face, set charges and reestablished the trail width. Setting charges at Red Pass. 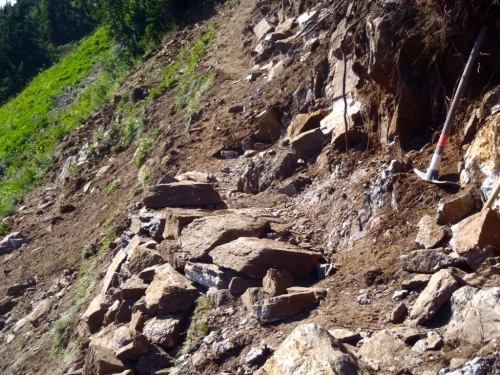 One of the complications for this project was that in addition to closing the PCT intermittently, another trail below had to be closed for several days to allow for drilling and blasting. In some situations, the work will release rock-fall, creating a safety issue for those below. The Granite Pass project tackled problem spots and is complete—equestrians are now able to travel safely through that shear-walled landscape. Unlike rock where they need to get the explosive inside to effectively move the mass, on logs they generally prefer to lash a bundle of explosive to the side. This provides a controlled blast that moves the log, stump and or root-wad in the desired direction to facilitate trail restoration. 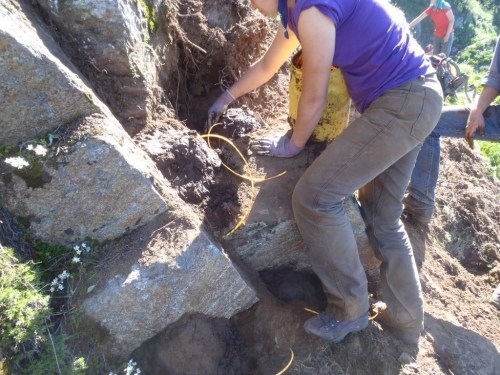 This process was used in 2016 to clear the PCT near Kendell Catwalk at mile 2,397 in the Alpine Lakes Wilderness where crosscut work was too dangerous. 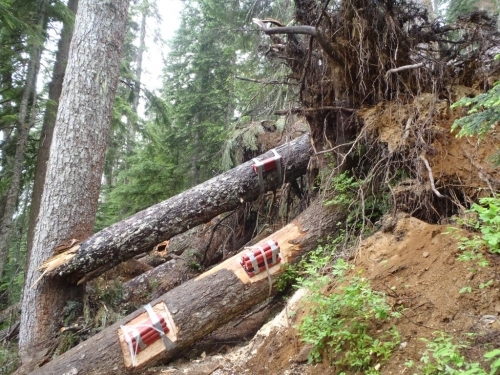 Likewise, the Suiattle Trail (the primary feeder to the PCT in Glacier Peak Wilderness) was opened to pack-stock in 2015 after a large log was blasted off the trail. 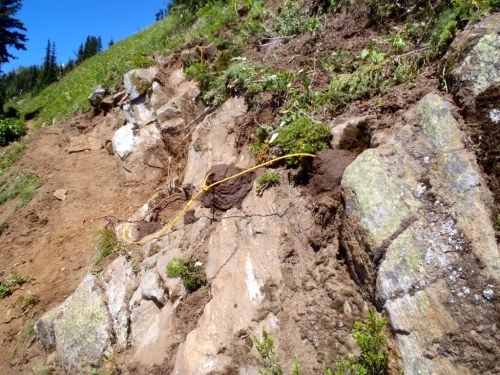 Surface blasting shattered a log north of Snoqualmie Pass at mile 2,394) in 2014. Trees that have the core burned out are extremely dangerous to drop by saw, so these are often wrapped with blasting cord or bundled explosive and brought to the ground where sawyers can safely buck them as needed. Newly blasted rock at Red Pass makes for a better trail. 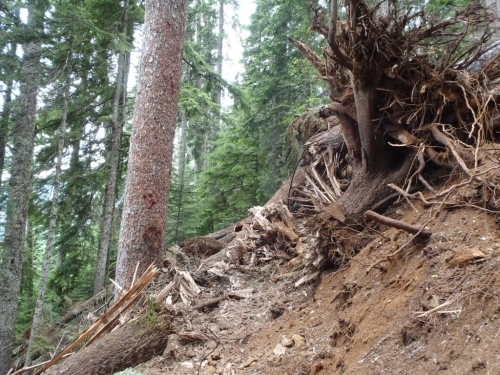 In June, the Forest Service authorizing a blasting project in Goat Rocks Wilderness, just below Old Snowy at mile 2,275. This is where two hikers were rescued in 2015. It’s a difficult section during ideal weather and extremely challenging with fog, snow and ice. The Gifford Pinchot National Forest will have gear and explosives packed in on mules by volunteers from the Lewis County Chapter of the Back Country Horsemen of Washington in September. The goal is to create a tread that will provide safe passage for stock and hikers for years to come. PCTA volunteers from the White Pass Chapter will follow this project to clean up after the blasting and complete trail restoration work on adjacent sections of trail. Our thanks go out to those few agency partners who make the extra effort to maintain their blasting certification. And let’s acknowledge all those who are passing on the skills of using traditional tools to the next generation of foresters. This is one way that our agency partners maintain the primitive nature of our remote public lands. Bill Hawley is our North Cascades Regional Representative. He's in charge of the PCT from Rock Creek in southern Washington to the Canadian border. His regional office is located in North Bend, Wash. Bill was out hiking the PCT “back before it was the PCT,” and has been a life-long devotee. He was an active volunteer before joining staff.